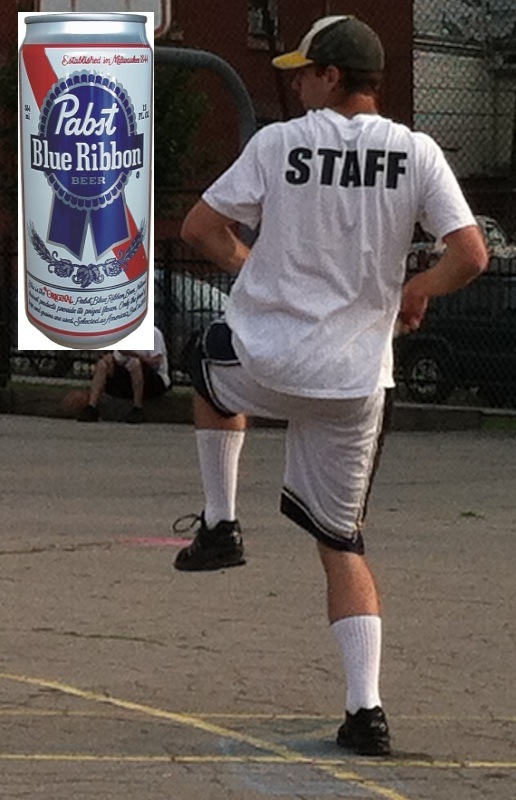 After a record-breaking week that included the best single-game offensive display in league history, Guthrie was voted the Pabst Blue Ribbon Wiffler of the Week for the third week of the 2012 EWL season. In the Caucasian’s first game, Guthrie pitched a complete game victory over the Ham Slams, giving up 5 runs on 8 hits, moving his record to 2-1 on the season. After getting off to a slow start at the plate in the 2012 season, this game was his launch pad. He went 3 for 6 with 2 singles, a homer, 2 runs scored, 3 RBI (including the game-winning RBI), and recorded a put-out in the field. The game was only a hint of what was to come in the night-cap. Guthrie’s second game, against Downtown Bobby Brown, rewrote the EWL record book. In a 22-4 win, all of the Caucasians had great numbers, but Guthrie’s were remarkable. He went an amazing 9 for 10 at the plate, missing a perfect 10 for 10 by a foot at first base in his final at-bat. He scored 7 runs, and drove in another 7. He had 4 singles, 2 doubles, and 3 homers, and also had the game-winning RBI. He registered 2 put-outs. Guthrie is the first EWL veteran (non-rookie) to win Wiffler of the Week in 2012. Guthrie was voted Wiffler of the Week twice in 2011; first in week 9 of the regular season and again in week 2 of the playoffs after pitching the only perfect game in league history. Guthrie was the 2011 EWL Pitch King and also was named to the 2011 All-EWL team. Guthrie broke or tied the single-game records for hits, runs, RBI, and total bases in week 3. Guthrie’s legendary week 3 performance earned him Wiffler of the Week honors for the third time in his career.